The Red Laser Junior Golf Outreach entered its fourth week recently, attracting a “great group” from the Salvation Army Vacation Bible School. 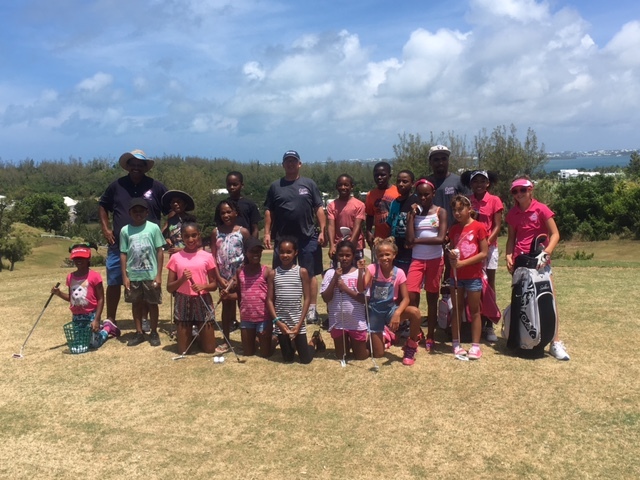 Port Royal Golf Course Director of Operations Mr. Greg Maybury said, “We at Port Royal were very pleased with the turnout today, especially with the involvement of the Salvation Army an outstanding community church serving across Bermuda. The summer junior golf outreach continues until August 1, with another golf tournament with “fabulous prizes supplied by Red Laser” is planned for August 21. Kim Swan, Port Royal Teaching Pro is encouraging parents to email him if they would like their children [ages 10+] to receive a free introduction to golf. Mr. Swan said, “Red Laser have provided an awesome opportunity for junior golfer. We have already identified new golf talent and welcome all – there is great opportunity available for young people in golf – as a public golf facility, we at Port Royal aim to do our part to grow the game. “I also owe a debt of gratitude to the Salvation Army for their positive influence in my formative development in the White Hill Community. At the gate of Port Royal sits a plaque commemorating the origins of the Salvation Army on this very property.